Don't you love "Back-to-School" days? As a full-time teacher, I have mixed feelings about my summer ending, but it always gives me new energy! When I came across this vintage image, it also reminded me of the days when children had three sets of clothes: "church" clothes, "play" clothes and "school" clothes. Today, all that seems to have morphed together into a uniform of jeans and t-shirts. 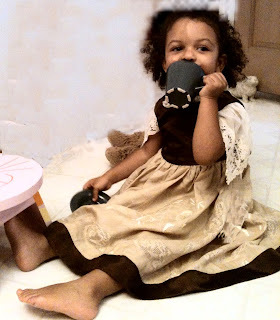 Well, I still think a little girl should have a few special outfits, and enjoy using vintage linens to create them. This dress was made from an appliqued card table cloth, using the napkins as the sleeves. 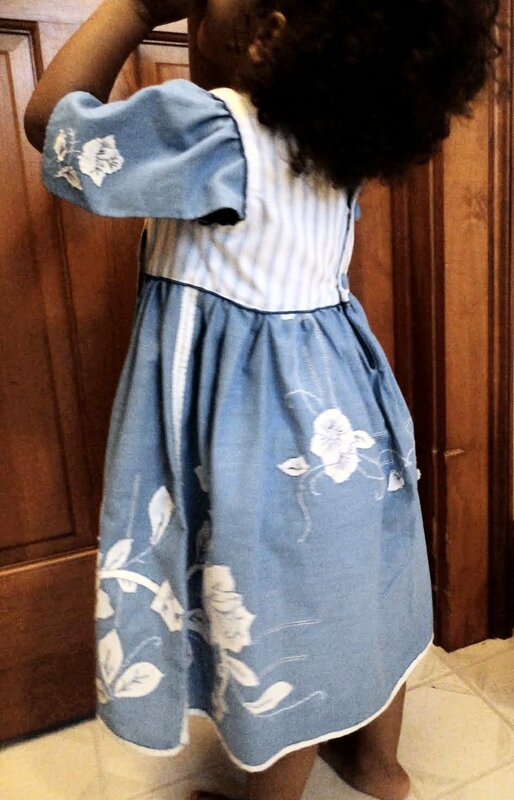 And this very special dress is made from a silk embroidered tablecloth and uses an antique hankie for the sleeves. The remainder is of brown taffeta. 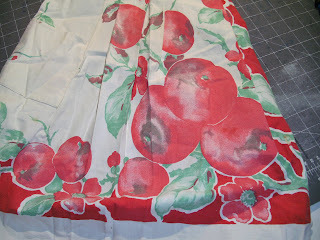 And this last dress uses two different vintage tablecloths and some left-over drapery lining. You might find a dress or a purse that would help ease you into another school year! I've just returned from a week in North Carolina, Tennessee and Virginia! While the purpose of the trip was spending some time with my parents, David and I took some extra time to visit antique shops from Asheville, NC and northward on our trip home, with stops in Erwin, Tennessee, and Bristol, Wytheville, Lexington and Harrisonburg, Virginia. Although the Internet has certainly made hunting for vintage items more convenient, I think it has also made it more difficult to find bargains. 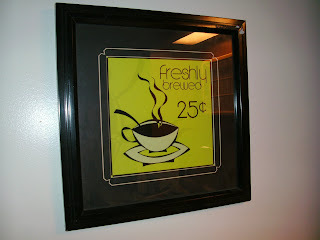 It seemed wherever we went, the prices were pretty uniform. We found one shop with the most amazing collection of feedsack material I have ever seen; sadly each piece of fabric was either $12.50 or $14.00 (for about a yard of material)! 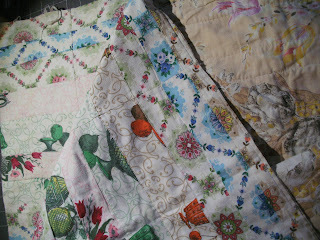 Vintage printed tablecloths run between $18 and $30 pretty much everywhere too. And that's just too much money when I know I'm going to be cutting it up and using it for projects! 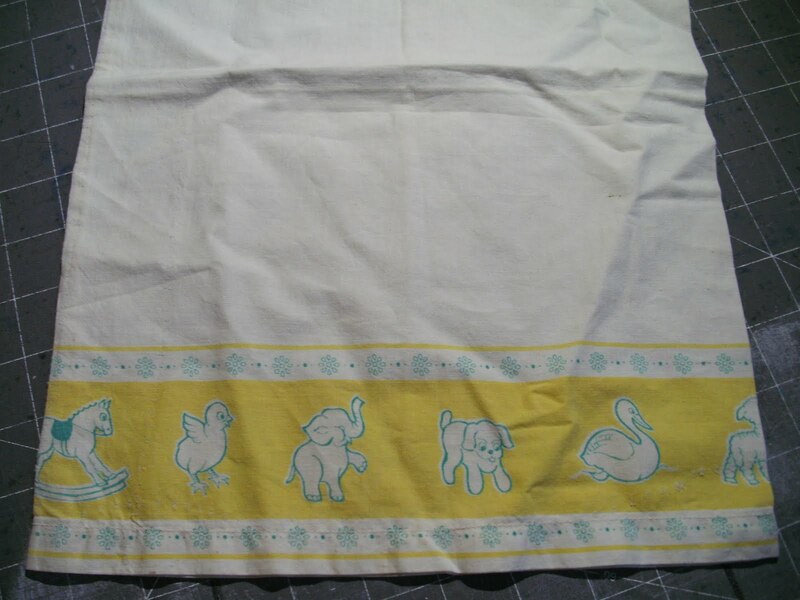 and the sweetest little baby pillowcase. 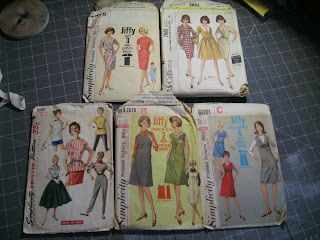 A tiny little shop in Erwin, Tennessee had an entire 6-drawer cabinet of vintage sewing patterns... for 50 cents each! To be honest, many of them were from the 1980s... not my favorite time period for clothing... but I snagged a bunch from the 1960s that I think will be fun to experiment with! So the lesson for us: Head for some of the little tucked away places where you can dig through the dirt and find some treasures! Back to the sewing machine for me! Let me know if I can make something special for you! Wouldn't our grandmothers and great-grandmothers be surprised at how the things they saw as the most ordinary now fetch high prices in antique stores and are treasured by collectors? 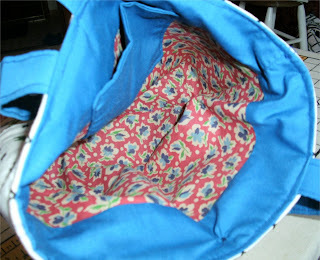 Feedsack fabric is a great example. Beginning in the late twenties, through the depression years, and even up into the 1950s, flour, sugar, and other staples were sold in cotton feedsacks. When manufacturers realized that frugal housewives were saving those cotton sacks and making quilts and clothing out of them, they began to create more attractive patterns and colors to entice buyers to select their brands. 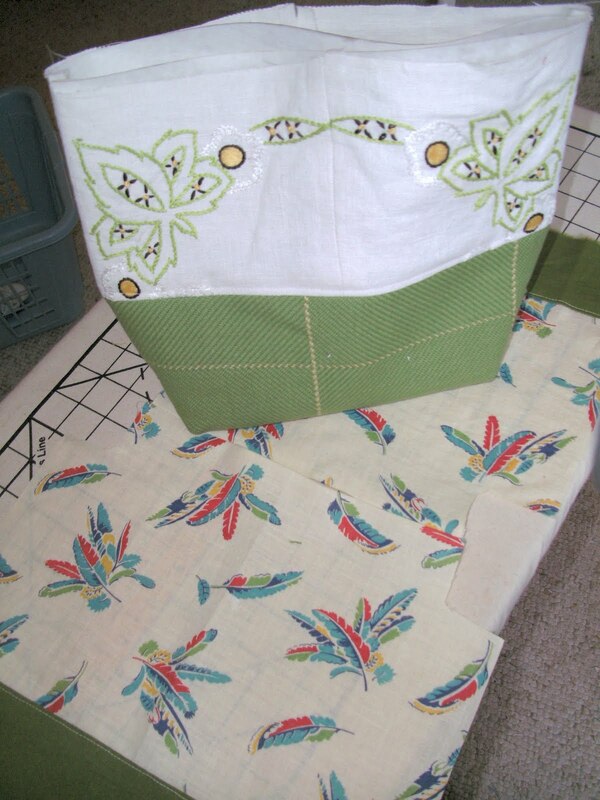 Today, feedsack fabric, and old quilts and aprons made of feedsacks are highly prized by collectors, and bring big money online and at antique stores. For fabric in good condition, a half yard can cost $20! But, as you can see by the picture of my small "stash" of feedsack fabric, the colors, motifs and general look is hard to resist. Because I know that I will be cutting whatever fabric I buy into pieces to use it in my clothing or accessories, I look for pieces that have holes or stains I can work around. That makes the piece more affordable! Most of what I find is no longer strong enough to use for clothing, but if I combine it with a lightweight fusible interfacing, it works very well for lining or trim. This skirt is an exception; the turquoise feedsack fabric was strong enough to use. This purse (shown under construction), which also incorporates portions of an embroidered dresser scarf and an upholstery sample square, uses feedsack fabric as a lining, as does the purse below. I wonder what ordinary items in our lives will be treasures to our grandchildren? 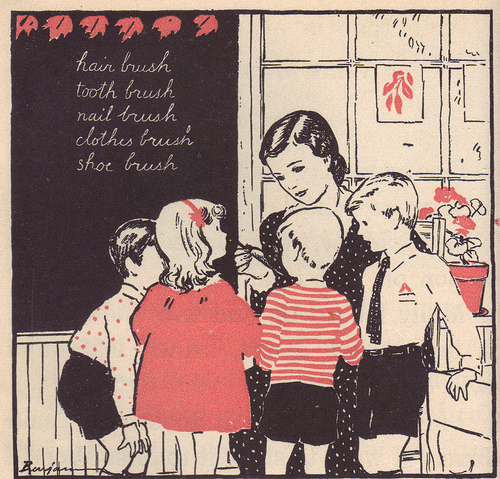 Maybe we should hang onto a few old cereal boxes, soda cans, and magazines; they might fund our kids' retirement! Contact me if I can make something for you from my stash or yours! What is it about baby things that seem to make us all turn to mush? My two wonderful children are adults now, and although I have three charming grand-dogs, their clothing needs are minimal. But I can't seem to stop drooling over adorable baby things (NO pressure, kids!). 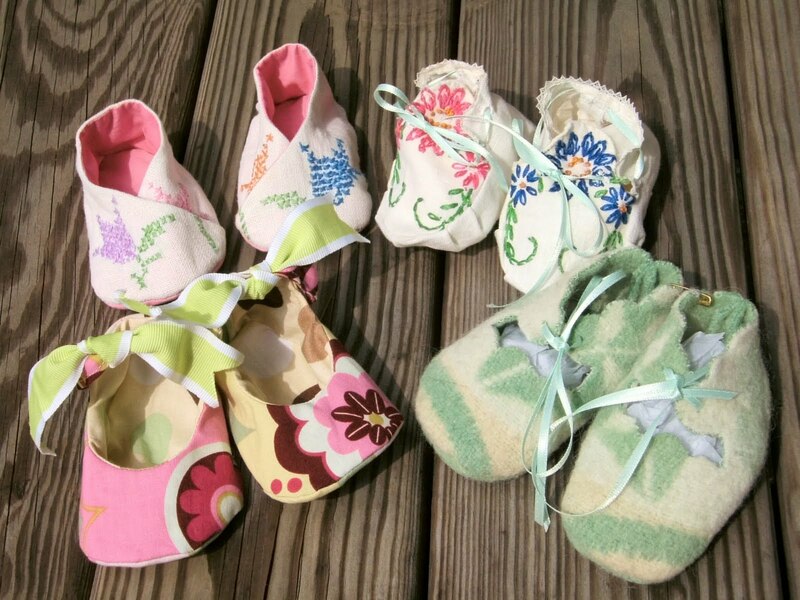 So while I wait (so patiently...) I've been making some baby booties out of upcycled fabric and scraps. The back two pairs are made from vintage table runners and doilies. Front right came from a wonderful old wool blanket I found at an antique store, and front left from the scraps left over from a dress I made for my daughter-in-law's new niece. To give credit where it is due, the booties on the right are from Simplicity pattern 2397 and the booties on the left are from www.littleshoepattern.etsy.com. 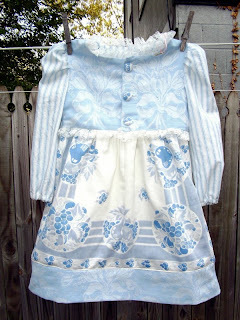 So, doting grammas and aunties... can I make something for your most precious one? My task? Take David's mother's mink stole and create two keepsake teddy bears from it for his sisters. I have to admit this was a daunting request. First, there would be no replacing the materials if I made a serious mistake. And second, I wanted to honor David's mother by doing a good job on this project. Finally, the fur was beginning to deteriorate and I was worried it just wouldn't stay sewn together! But, I launched into the project. First, I "deconstructed" the entire piece, which was actually pretty interesting. Seeing how it had been tailored to begin with taught me some things. Once I had exposed the fur itself, I realized that there wasn't enough fur with a stable skin under it to make two full bears, so I decided to use the fur for the back of the bear, and the satin lining for the front. There was also some brown velvet under the collar I could harvest and use. 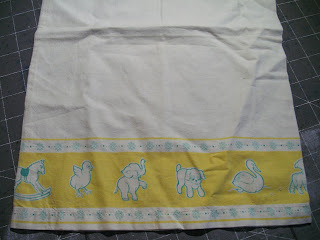 Finally, we decided to use the May Department Store tag in the stole for one of the bears (Mrs. Calhoun had worked at the store herself), and use the monogram sewn in the lining for the other. I had to do most of the sewing by hand... the pelts just would not have withstood the sewing machine. I ended up with bits of mink EVERYWHERE! I used the velvet on the nose, a couple of vintage buttons for the eyes and added a bow around the bear's neck. I think it came out quite nicely, and I know David's sisters are pleased with the keepsake. I think I'll use the rest of the satin and velvet to make some smaller bears for some of the sisters-in-law. Next up? David's mother's chenille bathrobe.... I wonder what I can make out of that? It's a real struggle I have: everywhere I turn, there are fabulous vintage tablecloths and textiles, and I want to buy them all! 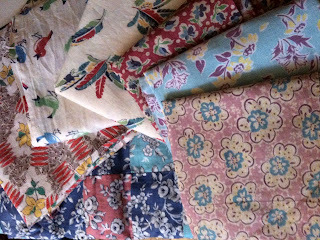 The closet is full, and I could work 24 hours a day making things, and still have fabric left. I am a firm believer in that saying, "She who dies with the most fabric, WINS!" But I've been trying to restrain myself. However, every now and then, the little "Ebay" app on my iPhone calls to me, and I do a quick search on "vintage tablecloths." This last time, I searched for "cutters." 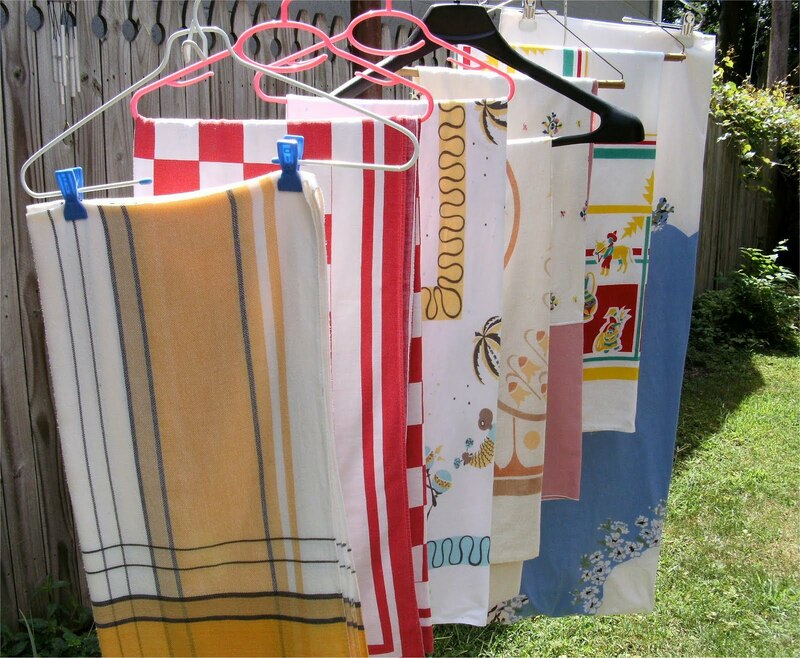 Cutters are tablecloths, quilts, or other linens that have stains, or tears, or holes, and can't really be used for their original purpose. They are suitable for cutting, hence their name. Yesterday I received the awaited box in the mail--a group of seven "cutters" that I got cheap. I opened up the box, and was immediately assaulted with the smell of cigarette smoke. Yuck! Fortunately, after taking them directly to the laundry room, a soak in some Oxyclean, and then a trip through a hot water wash, left them smelling just fine. To be extra safe (and because I just really love to do it), I hung them outside in the hot sunshine to dry. Overall, I'm pleased. 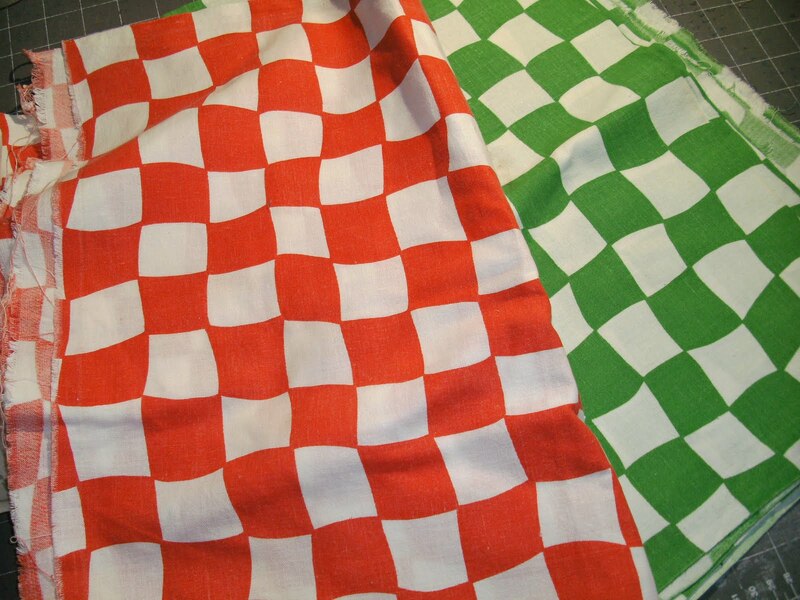 Some holes, some stains, but some very usable tablecloths. My favorite is the bright Mexican theme one second from the back. 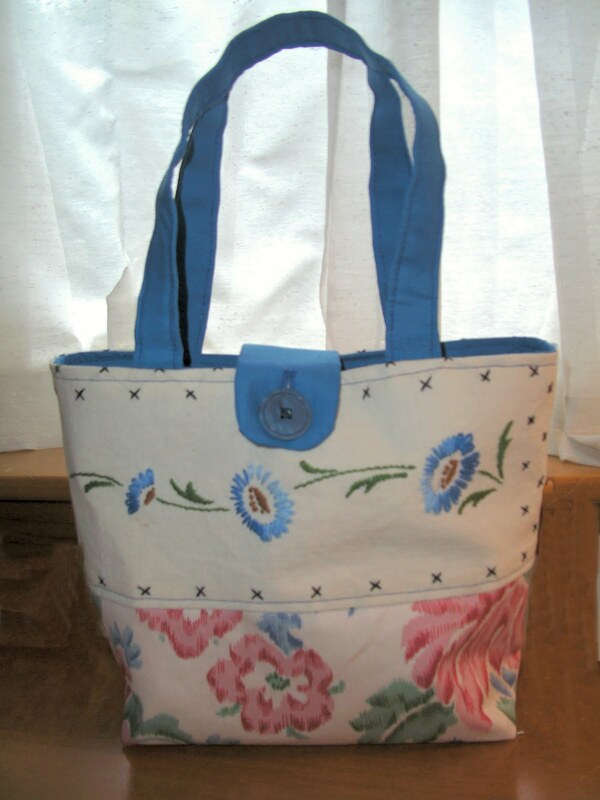 See anything you'd like me to make a purse or a skirt out of for YOU?